Drivers looking for anything from bare-bones practicality to elite luxury can find their match with the 2017 Ram 1500. This full-size, light-duty pickup truck is available in multiple trims, body styles, and capability levels that can make it perfect for a variety of different drivers. In this 2017 Ram 1500 Laramie vs Laramie Longhorn comparison, we are going to look at two of the upper trim levels. Both the Laramie and the Laramie Longhorn come loaded with comfort and convenience technology, leather and real wood accents, and can-do capability. However, there are several differences worth mentioning. One of the biggest differences is engine output. The 2017 Ram 1500 Laramie Longhorn comes standard with a more powerful 5.7-liter V-8 engine rated for 395 horsepower and 410 pound-feet of torque. This engine can handle up to 10,640 pounds towing. The 2017 Ram 1500 Laramie is available with this V-8, but its standard engine is a 3.6-liter V-6. This V-6 is certainly robust (offering 305 horsepower and 269 pound-feet of torque) but it isn't as dominating as the V-8 standard on the Laramie Longhorn. While more power can have an instant appeal for truck shoppers, it also comes with an increase in price. There are other differences when comparing the 2017 Ram 1500 Laramie vs the Laramie Longhorn. The Laramie is available both in spacious Crew Cab and more compact Quad Cab body styles, while the Laramie Longhorn is available only in the top Crew Cab model. All-wheel drive is available on either of these trims, while the user-friendly 8.4-inch Uconnect touchscreen infotainment system comes standard on both. The Laramie comes with leather trimmed front seats with heating and ventilation, while the Laramie Longhorn upgrades the front leather seating, and adds leather trim to the rear seats as well. Both of these trims feature driver memory settings, a 10-speaker sound system, and a six-way powered passenger seat. Notable extra features on the 2017 Ram 1500 Laramie Longhorn include a built-in navigation system, a spray-in bedliner, tow hooks, a larger fuel tank, keyless ignition and rear parking sensors. 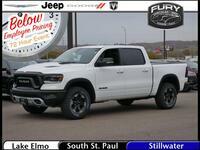 If you are interested in learning more about the trims available on the 2017 Ram 1500, or in test driving the Laramie or Laramie Longhorn in the Twin Cities area, contact a member of the Fury Ram Truck Center today.